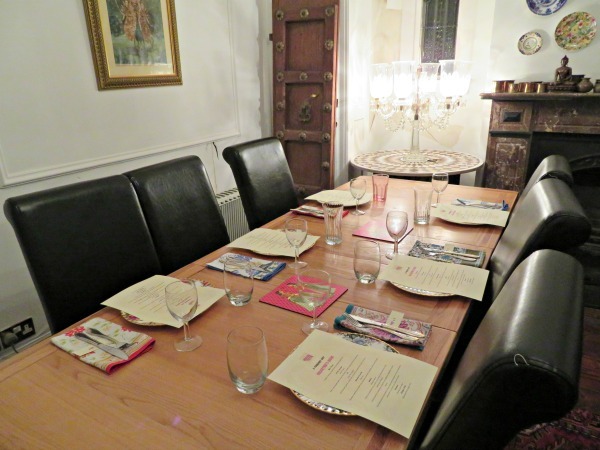 The theme of the supper club on this evening was Maharashtrian coastal food, from Maharastra, a state in the Western region of India where Mumbai is the capital but this can vary by theme each month. Inspired by the royal kitchens of princely states and Mughal regions of India, Maharani seems a fit name for the supper club, meaning a wife married to a Maharaji; a princess of a royal family in India. Our menu of the evening contained 5 courses for £35pp, each as intriguing as the next and I couldn’t wait to see what was to come. My friend and I were the first to arrive and were greeted at the door by Priya herself. We had been following each other on Instagram for a long time, so it was lovely to finally meet her in person! She regularly posts recipes on her website that sound delicious, and I am definitely going to be trying tocook some myself soon. 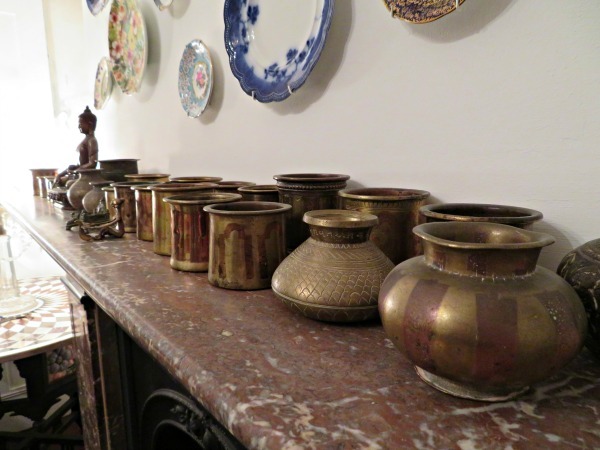 Priya showed us into the dining room complete with two long communal tables and set with vintage floral crockery, colourful cloth napkins and with Indian artefacts and pictures surrounding the walls. 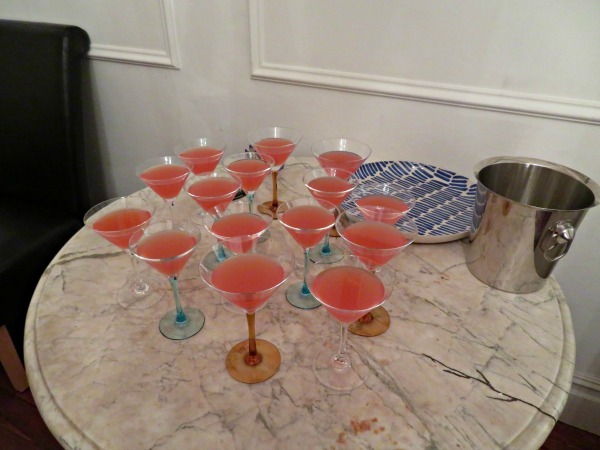 We were given a welcome cocktail made from watermelon, vodka and Campari that was refreshing and packed a punch – my kind of drink! It’s a BYO evening too, so we had bought a lovely bottle of Chilean wine from Seven Cellars based on their recommendations to match with the menu. As everyone else started to arrive, we all introduced each other and then took our seats. It was great to hear a few regulars attendees were here, always a promising sign! The first dishes started to arrive, with Priya giving us some information about them as they were placed down. She has a small team of women to help her in the kitchen and with service so she is able to mingle and chat with the guests which I think is nice. 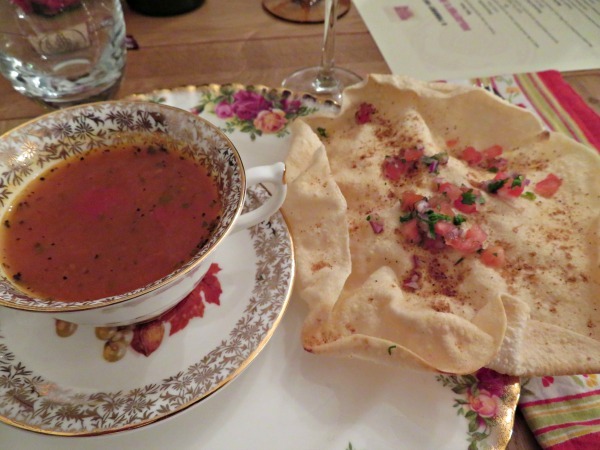 Placed in front of us was a pretty teacup filled with a tomato cha saar soup that smelt incredible and we had a couple of platters topped with garnished poppadums on the table. The soup was rich in toasted spices, with a good kick and had a lovely warming ginger flavour to it too. 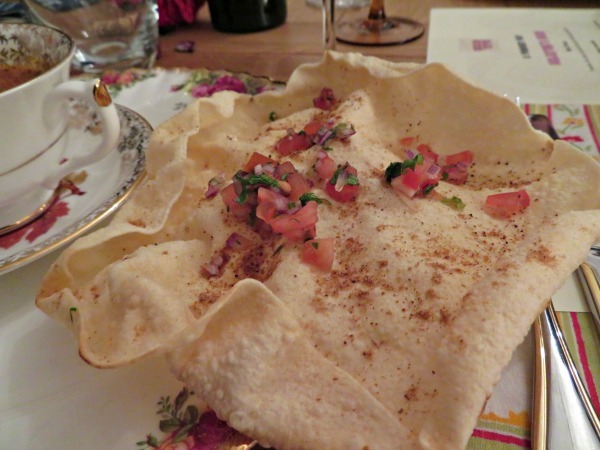 The poppadums crunched perfectly and were topped with tomatoes, onion and a spice mix called Chaat masala which I need to find and buy as soon as possible. It’s a spice mix used widely in Indian street food as a flavour and seasoning sprinkled on top of dishes. Common ingredients are dried mango powder, cumin, coriander, dried ginger, salt, pepper, asafoetida and chilli powder, so it’s slightly spicy, but fruity, warming and a little sweet too. There is something about Indian cookery that I respect as they really know how to use their spices to create unique flavour combinations. 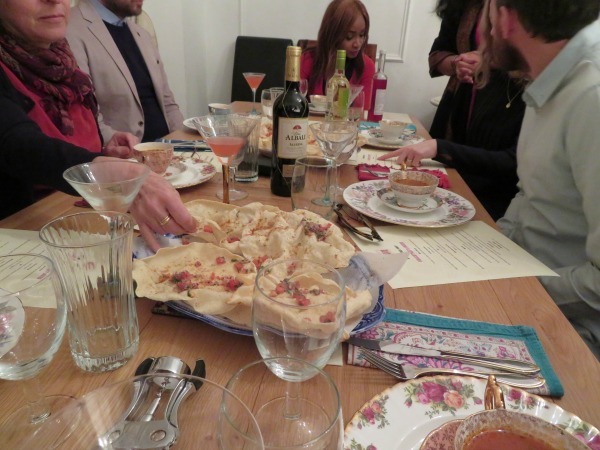 Our taste buds were tingling and the next course created great anticipation, as it has been a favourite in previous supper clubs and a signature dish of Priya’s because of this. 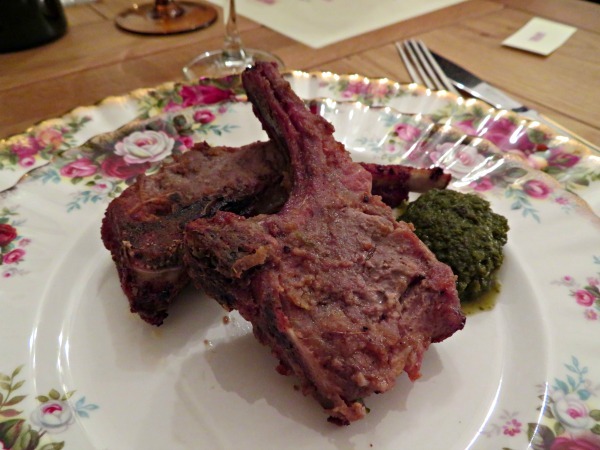 They were marinated lamb chops served with a mint and coriander slightly spiced chutney. The lamb is marinated in green papaya which is a natural meat tenderizer as well as black cardamom to produce a lovely soft and tender cutlet. They were so good that everyone were picking up the chops in the end and getting as much as they could off the bone. I could’ve eaten 4 more of these at least, but as Priya said, there is plenty of food to come so we need to leave room! 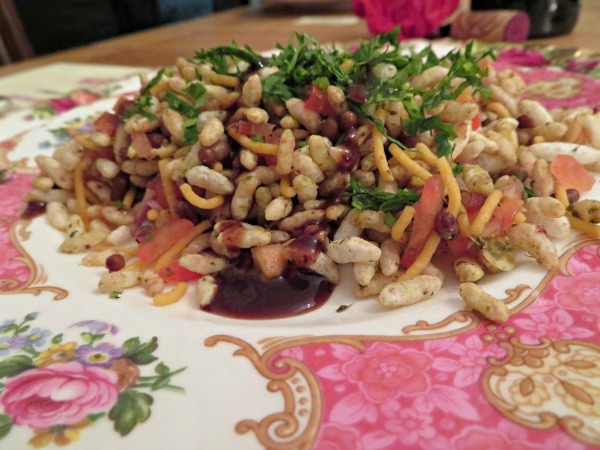 Next we were brought one of my favourite Indian street food dishes – the Bhel Puri. It’s made up of puffed rice, chickpea noodles, mort beans (like mung beans but brown) which are popular in Mumbai. Also, tamarind, coriander, tomatoes and chutney. It’s sweet, sour, crunchy and slightly spicy and always a refreshing combination to have between dishes. Both my friend and I really enjoyed our surrounding company, we had a great mix of people but all with a similar love for good food. 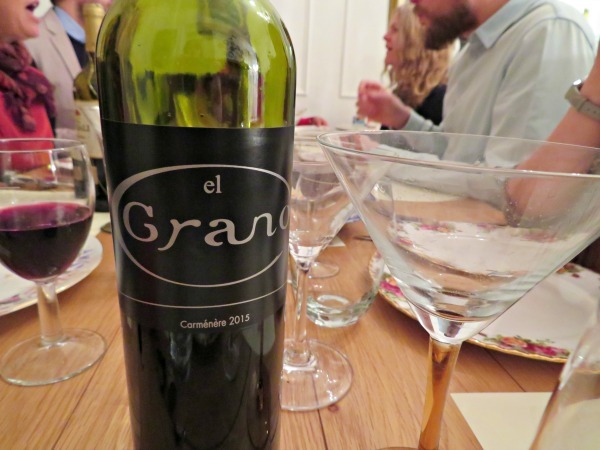 Our wine was perfectly matched with the menu so far, it had notes of blackberries and cassis so nice and sweet but had nice depth to it too to balance the big spices and flavours of the cooking. It was time for the mains and we were all brought a plate each with a grilled mackerel fillet, fresh from a local fishmonger in Hove and fresh raita on the side. 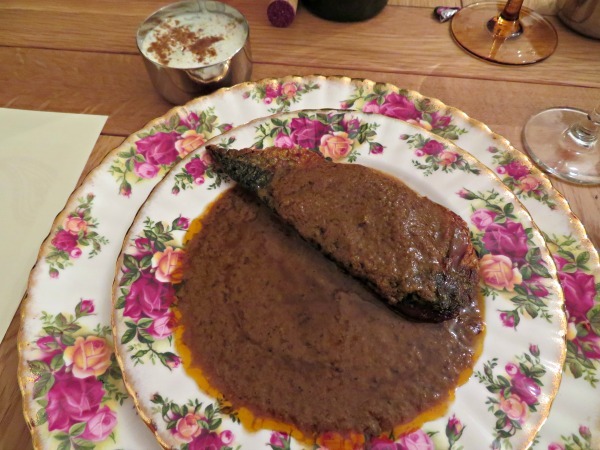 There was a large bowl of the curry gravy that we passed around the table and ladled over the fish. Priya encouraged us to be generous, as we had a Maharashtrian style dosa to come to use for dipping. There was also a cauliflower masala passed around to add to the plate. I started eating this with my knife and fork but then decided to dig in with my hand – just like they would in India. The gravy was made to a traditional Maharashtrian coastal recipe, and was rich and fiery with a nice spice, but not overpowering either. It really stood up to the strong mackerel, that was fresh and not overpowering for the curry flavours either. 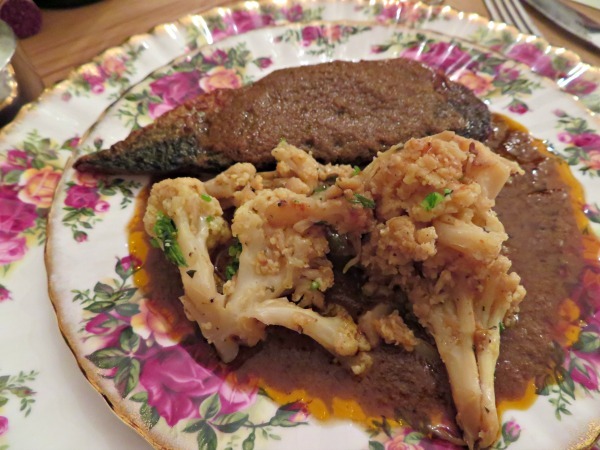 The cauliflower was tender and coated in lovely masala spices and the raita provided a cooling effect to balance the strong mackerel and curry. I was completely transported to a coastal town in India and still thinking about this dish today. This style of dosa is thicker than the dosa you would probably know, but was perfect for this dish and completely gluten free too. Priya said it takes 2 days to make as she ferments the rice and urad beans and grinds them down with a stone grinder she imported from India. Her dedication and talent is so inspiring! After 2 dosas and a healthy portion of gravy sauce I was now starting to feel the full. I could see dessert was halwa so I knew it wouldn’t be too heavy which was perfect. 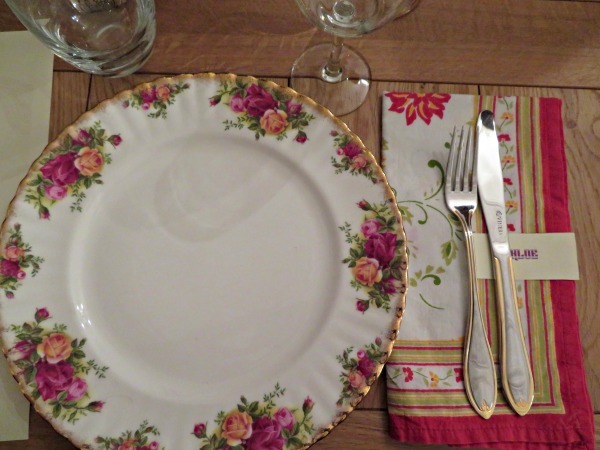 It was served on a small saucer with a sliver of edible silver and pistachios scattered over. 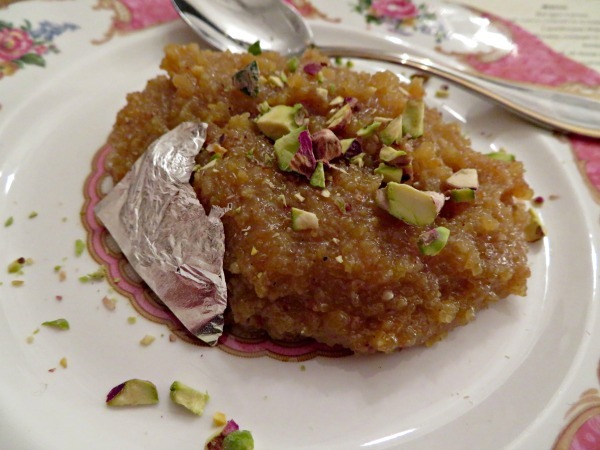 The halwa was made with moong dhal and had lovely cardamom and ginger flavours and a sort of grainy texture that I liked. To follow and end the meal we had a teapot brimming with homemade ginger chai passed around the table and I couldn’t think of a better way to finish the evening. 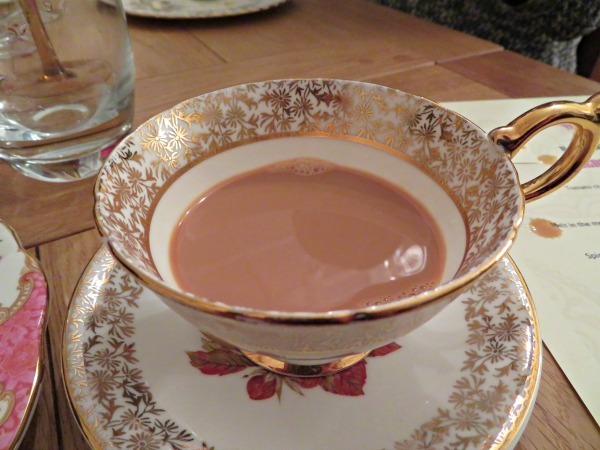 It was lovely and strong and very warming, putting a happy smile on everyone’s face. 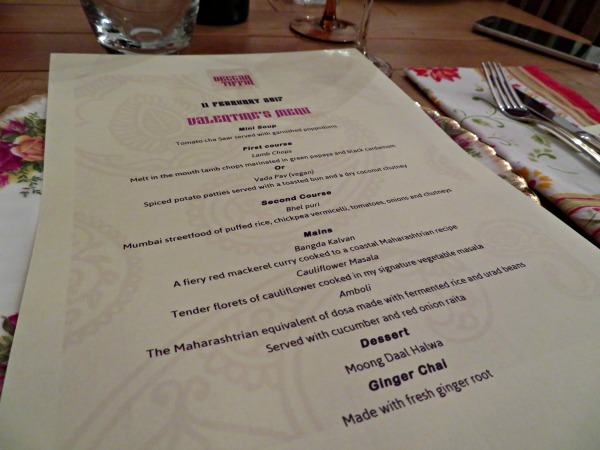 I couldn’t rave more about our evening at the Maharani supper club, and I am seriously considering booking onto the next or one to follow. 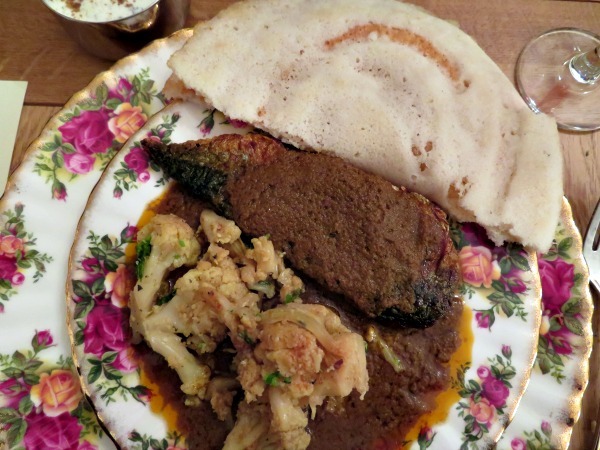 Priya hosts them once a month from her Victorian Villa in Hove but also can be found across restaurants and cafes holding pop-up events over Brighton. I find her passion for food from the heart; from her face lighting up talking about dishes she tried during her travels, to her knowledge and dedication to ingredients and recipes. Please go and try it for yourself soon! * I was invited by Priya complimentary but my words are 100% genuine.